Idaho is a state in the northwestern region of the United States. It borders the state of Montana to the east and northeast, Wyoming to the east, Nevada and Utah to the south, and Washington and Oregon to the west. To the north, it shares a small portion of the Canadian border with the province of British Columbia. With a population of around 1.6 million and an area of 83,569 square miles (216,440 km2), Idaho is the 14th largest, the 39th most populous and the 7th least densely populated of the 50 U.S. states. The state's capital and largest city is Boise. Forming part of the Pacific Northwest (and the associated Cascadia bioregion), Idaho is divided into several distinct geographic and climatic regions. In the state's north, the relatively isolated Idaho Panhandle is closely linked with Eastern Washington, with which it shares the Pacific Time Zone – the rest of the state uses the Mountain Time Zone. The state's south includes the Snake River Plain (which contains most of the population and agricultural land), while the south-east incorporates part of the Great Basin. Idaho is quite mountainous, and contains several stretches of the Rocky Mountains. 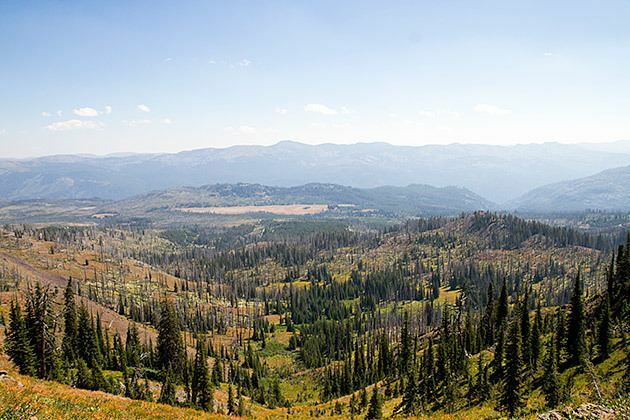 Additionally, around 38 percent of Idaho's land is held by the United States Forest Service, the most of any state. Industries significant for the state economy include manufacturing, agriculture, mining, forestry, and tourism. A number of science and technology firms are either headquartered in Idaho or have factories there, and the state also contains the Idaho National Laboratory, which is the largest Department of Energy facility in the country. Idaho's agricultural sector supplies a number of different products, but the state is best known for its potato crop, which comprises around one-third of the nationwide yield. The official state nickname is the "Gem State", which references Idaho's reputation for gemstones and, more broadly, its many wilderness areas. The exact origin of the name remains a mystery. In the early 1860s, when the United States Congress was considering organizing a new territory in the Rocky Mountains, eccentric lobbyist George M. Willing suggested the name "Idaho", which he claimed was derived from a Shoshone language term meaning "the sun comes from the mountains" or "gem of the mountains". Willing later claimed he had simply invented the name. Congress ultimately decided to name the area Colorado Territory when it was created in February 1861. Thinking they would get a jump on the name, locals named a community in Colorado "Idaho Springs". However, the name "Idaho" did not fall into obscurity. The same year Congress created Colorado Territory, a county called Idaho County was created in eastern Washington Territory. The county was named after a steamship named Idaho, which was launched on the Columbia River in 1860. It is unclear whether the steamship was named before or after Willing's claim was revealed. Regardless, a portion of Washington Territory, including Idaho County, was used to create Idaho Territory in 1863. "Idaho" is a Shoshoni Indian exclamation. The word consists of three parts. The first is "Ee", which in English conveys the idea of "coming down". The second is "dah" which is the Shoshoni stem or root for both "sun" and "mountain". The third syllable, "how", denotes the exclamation and stands for the same thing in Shoshoni that the exclamation mark (!) does in the English language. The Shoshoni word is "Ee-dah-how", and the Indian thought thus conveyed when translated into English means, "Behold! the sun coming down the mountain. An alternative etymology attributes the name to the Plains Apache word "ídaahę́" (enemy) that was used in reference to The Comanche. Idaho borders six US states and one Canadian province. The states of Washington and Oregon are to the west, Nevada and Utah are to the south, and Montana and Wyoming are to the east. Idaho also shares a short border with the Canadian province of British Columbia to the north. The landscape is rugged with some of the largest unspoiled natural areas in the United States. For example, at 2.3 million acres (930,000 ha), the Frank Church-River of No Return Wilderness Area is the largest contiguous area of protected wilderness in the continental United States. 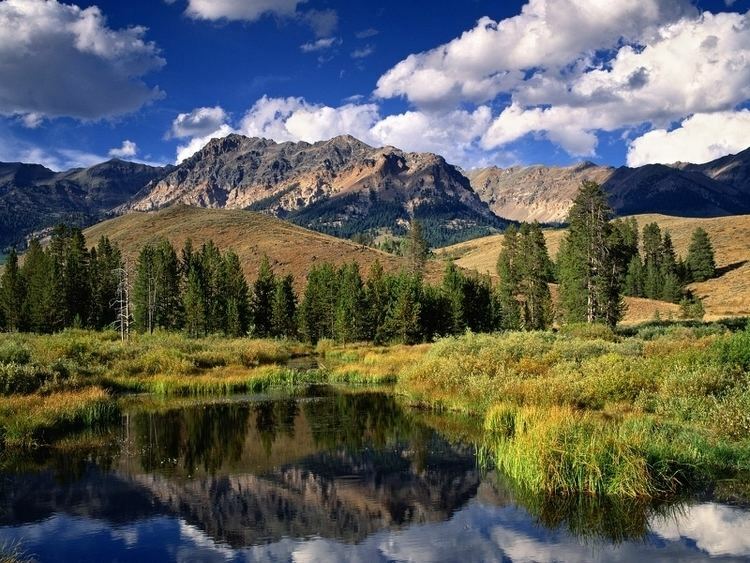 Idaho is a Rocky Mountain state with abundant natural resources and scenic areas. The state has snow-capped mountain ranges, rapids, vast lakes and steep canyons. The waters of the Snake River rush through Hells Canyon, the deepest gorge in the United States. Shoshone Falls plunges down rugged cliffs from a height greater than Niagara Falls. The major rivers in Idaho are the Snake River, the Clark Fork/Pend Oreille River, the Clearwater River, and the Salmon River. Other significant rivers include the Coeur d'Alene River, the Spokane River, the Boise River, and the Payette River. The Salmon River empties into the Snake in Hells Canyon and forms the southern boundary of Nez Perce County on its north shore, of which Lewiston is the county seat. The Port of Lewiston, at the confluence of the Clearwater and the Snake Rivers is the farthest inland seaport on the West Coast at 465 river miles from the Pacific at Astoria, Oregon. Idaho's highest point is Borah Peak, 12,662 ft (3,859 m), in the Lost River Range north of Mackay. Idaho's lowest point, 710 ft (216 m), is in Lewiston, where the Clearwater River joins the Snake River and continues into Washington. The Sawtooth Range is often considered Idaho's most famous mountain range. Other mountain ranges in Idaho include the Bitterroot Range, the White Cloud Mountains, the Lost River Range, the Clearwater Mountains, and the Salmon River Mountains. Idaho has two time zones, with the dividing line approximately midway between Canada and Nevada. Southern Idaho, including the Boise metropolitan area, Idaho Falls, Pocatello, and Twin Falls, are in the Mountain Time Zone. A legislative error (15 U.S.C. ch. 6 §264) theoretically placed this region in the Central Time Zone, but this was corrected with a 2007 amendment. Areas north of the Salmon River, including Coeur d'Alene, Moscow, Lewiston, and Sandpoint, are in the Pacific Time Zone, which contains less than a quarter of the state's population and land area. Idaho's climate varies widely. Although the state's western border is about 350 miles (560 km) from the Pacific Ocean, the maritime influence is still felt in Idaho, especially in the winter when cloud cover, humidity, and precipitation are at their maximum extent. This influence has a moderating effect in the winter where temperatures are not as low as would otherwise be expected for a northern state with predominantly high elevations. The maritime influence is least prominent in the state's eastern part where the precipitation patterns are often reversed, with wetter summers and drier winters, and seasonal temperature differences are more extreme, showing a more semi-arid continental climate. Idaho can be hot, although extended periods over 98 °F (37 °C) for the maximum temperature are rare, except for the lowest point in elevation, Lewiston, which correspondingly sees little snow. Hot summer days are tempered by the low relative humidity and cooler evenings during summer months since, for most of the state, the highest diurnal difference in temperature is often in the summer. Winters can be cold, although extended periods of bitter cold weather below zero are unusual. Idaho's all-time highest temperature of 118 °F (48 °C) was recorded at Orofino on July 28, 1934; the all-time lowest temperature of −60 °F (−51 °C) was recorded at Island Park Dam on January 18, 1943. Humans may have been present in the Idaho area as long as 14,500 years ago. 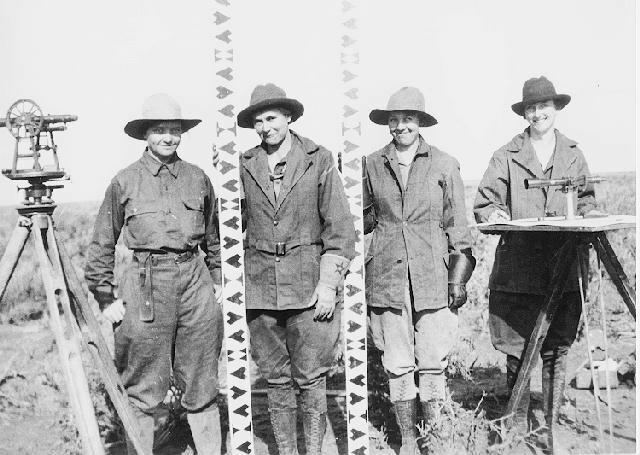 Excavations at Wilson Butte Cave near Twin Falls in 1959 revealed evidence of human activity, including arrowheads, that rank among the oldest dated artifacts in North America. American Indian peoples predominant in the area included the Nez Percé in the north and the Northern and Western Shoshone in the south. An early presence of French-Canadian trappers is visible in names and toponyms: Nez Percé, Cœur d'Alène, Boisé, Payette, some preexisting the Lewis and Clark and Astorian expeditions which themselves included significant numbers of French and Métis guides recruited for their familiarity with the terrain. Idaho, as part of the Oregon Country, was claimed by both the United States and Great Britain until the United States gained undisputed jurisdiction in 1846. From 1843 to 1849, present-day Idaho was under the de facto jurisdiction of the Provisional Government of Oregon. When Oregon became a state, what is now Idaho was in what remained of the original Oregon Territory not part of the new state, and designated as the Washington Territory. Between then and the creation of the Idaho Territory on March 4, 1863, at Lewiston, parts of the present-day state were included in the Oregon, Washington, and Dakota Territories. The new territory included present-day Idaho, Montana, and most of Wyoming. The Lewis and Clark expedition crossed Idaho in 1805 on the way to the Pacific and in 1806 on the return, largely following the Clearwater River both directions. The first non-indigenous settlement was Kullyspell House, established on the shore of Lake Pend Oreille for fur trading in 1809 by David Thompson of the North West Company. In 1812 Donald Mackenzie, working for the Pacific Fur Company at the time, established a post on the lower Clearwater River near present-day Lewiston. This post, known as "MacKenzie's Post" or "Clearwater", operated until the Pacific Fur Company was bought out by the North West Company in 1813, after which it was abandoned. The first attempts at organized communities, within the present borders of Idaho, were established in 1860. The first permanent, substantial incorporated community was Lewiston in 1861. After some tribulation as a territory, including the chaotic transfer of the territorial capital from Lewiston to Boise, disenfranchisement of Mormon polygamists upheld by the U.S. Supreme Court in 1877, and a federal attempt to split the territory between Washington Territory which gained statehood in 1889, a year before Idaho, and the state of Nevada which had been a state since 1864, Idaho achieved statehood in 1890. Idaho was one of the hardest hit of the Pacific Northwest states during the Great Depression. Prices plummeted for Idaho's major crops: in 1932 a bushel of potatoes brought only $.10 compared to $1.51 in 1919, while Idaho farmers saw their annual income of $686 in 1929 drop to $250 by 1932. In recent years, Idaho has expanded its commercial base as a tourism and agricultural state to include science and technology industries. Science and technology have become the largest single economic center (over 25% of the state's total revenue) within the state and are greater than agriculture, forestry and mining combined. The United States Census Bureau estimates Idaho's population was 1,654,930 on July 1, 2015, a 5.57% increase since 2010. 2.5% of two or more races. 11.2% of Idaho's population was of Hispanic or Latino (they may be of any race). As of 2011, 27.2% of Idaho's children under the age of one belonged to racial or ethnic minority groups, meaning they had at least one parent who was not non-Hispanic white. Idaho had an estimated population of 1,654,930 in 2015, which was an increase of 20,466, from the prior year and an increase of 87,348, or 5.57%, since 2010. This includes a natural increase since the last census of 58,884 people (that is, 111,131 births minus 52,247 deaths) and an increase due to net migration of 75,795 people into the state. There are large numbers of Americans of English and German ancestry in Idaho. Immigration from outside the United States resulted in a net increase of 14,522 people, and migration within the country produced a net increase of 61,273 people. This made Idaho the sixth fastest-growing state after Arizona, Nevada, Florida, Georgia, and Utah. From 2004 to 2005, Idaho grew the third-fastest, surpassed only by Nevada and Arizona. Nampa, about 20 miles (30 km) west of downtown Boise, became the state's second largest city in the late 1990s, passing Pocatello and Idaho Falls. Nampa's population was under 29,000 in 1990 and grew to over 81,000 by 2010. Located between Nampa and Boise, Meridian also experienced high growth, from under 10,000 residents in 1990 to over 75,000 in 2010 and is now Idaho's third largest city. Growth of 5% or more over the same period has also been observed in Caldwell, Coeur d'Alene, Post Falls, and Twin Falls. From 1990 to 2010, Idaho's population increased by over 560,000 (55%). The Boise Metropolitan Area (officially known as the Boise City-Nampa, ID Metropolitan Statistical Area) is Idaho's largest metropolitan area. Other metropolitan areas in order of size are Coeur d'Alene, Idaho Falls, Pocatello and Lewiston. As of 2006, six official micropolitan statistical areas are based in Idaho. Twin Falls is the largest of these. The most common reported ancestries in the state are: German (18.9%), English (18.1%), Irish (10%), American (8.4%), Norwegian (3.6%), and Italian (3.5%). According to the Association of Religion Data Archives, the largest denominations by number of members in 2010 were The Church of Jesus Christ of Latter-day Saints with 409,265; the Catholic Church with 123,400; the non-denominational Evangelical Protestant with 62,637; and the Assemblies of God with 22,183. English is the state's predominant language. Minority languages include Spanish  and various Native American languages. Gross state product for 2015 was $64.9 billion, and the per capita income based on 2015 GDP and 2015 population estimates was $39,100. Idaho is an important agricultural state, producing nearly one-third of the potatoes grown in the United States. All three varieties of wheat, dark northern spring, hard red, and soft white are grown in the state. Nez Perce County is considered a premier soft white growing locale. Important industries in Idaho are food processing, lumber and wood products, machinery, chemical products, paper products, electronics manufacturing, silver and other mining, and tourism. The world's largest factory for barrel cheese, the raw product for processed cheese is in Gooding, Idaho. It has a capacity of 120,000 metric tons per year of barrel cheese and belongs to the Glanbia group. The Idaho National Laboratory (INL) is the largest Department of Energy facility in the country by area. INL is an important part of the eastern Idaho economy. Idaho also is home to three facilities of Anheuser-Busch which provide a large part of the malt for breweries across the nation. Locally, a variety of industries are important. Outdoor recreation is a common example ranging from numerous snowmobile and downhill and cross-country ski areas in winter to the evolution of Lewiston as a retirement community based on mild winters, dry, year-round climate and one of the lowest median wind velocities anywhere, combined with the rivers for a wide variety of activities. Other examples would be ATK Corporation, which operates three ammunition and ammunition components plants in Lewiston. Two are sporting and one is defense contract. The Lewis-Clark valley has an additional independent ammunition components manufacturer and the Chipmunk rifle factory until it was purchased in 2007 by Keystone Sporting Arms and production was moved to Milton, Pennsylvania. Four of the world's six welded aluminum jet boat (for running river rapids) manufacturers are in the Lewiston-Clarkston, WAvalley. Wine grapes were grown between Kendrick and Juliaetta in the Idaho Panhandle by the French Rothschilds until Prohibition. In keeping with this, while there are no large wineries or breweries in Idaho, there are numerous and growing numbers of award-winning boutique wineries and microbreweries in the northern part of the state. Today, Idaho's largest industry is the science and technology sector. It accounts for over 25% of the state's revenue and over 70% of the state's exports. Idaho's industrial economy is growing, with high-tech products leading the way. Since the late 1970s, Boise has emerged as a center for semiconductor manufacturing. Boise is the home of Micron Technology, the only U.S. manufacturer of dynamic random-access memory (DRAM) chips. Micron at one time manufactured desktop computers, but with very limited success. Hewlett-Packard has operated a large plant in Boise since the 1970s, which is devoted primarily to LaserJet printers production. Boise-based Clearwater Analytics is another rapidly growing investment accounting and reporting software firm, reporting on over $1 trillion in assets. ON Semiconductor, whose worldwide headquarters in Pocatello, is a widely recognized innovator in modern integrated mixed-signal semiconductor products, mixed-signal foundry services, and structured digital products. Coldwater Creek, a women's clothing retailer, is headquartered in Sandpoint. Sun Microsystems (now a part of Oracle Corporation) has two offices in Boise and a parts depot in Pocatello. Sun brings $4 million in annual salaries and over $300 million of revenue to the state each year. A number of Fortune 500 companies started in or trace their roots to Idaho, including Safeway in American Falls, Albertsons in Boise, JR Simplot across southern Idaho, and Potlatch Corp. in Lewiston. Zimmerly Air Transport in Lewiston-Clarkston was one of the five companies in the merger centered around Varney Air Lines of Pasco, Washington, which became United Airlines and subsequently Varney Air Group that became Continental Airlines. The state personal income tax ranges from 1.6% to 7.8% in eight income brackets. Idahoans may apply for state tax credits for taxes paid to other states, as well as for donations to Idaho state educational entities and some nonprofit youth and rehabilitation facilities. The state sales tax is 6% with a very limited, selective local option up to 6.5%. Sales tax applies to the sale, rental or lease of tangible personal property and some services. Food is taxed, but prescription drugs are not. Hotel, motel, and campground accommodations are taxed at a higher rate (7% to 11%). Some jurisdictions impose local option sales tax. The sales tax was introduced at 3% in 1965, easily approved by voters, where it remained until 1983. In 2014, Idaho emerged as the second most small business friendly state, ranking behind Utah, based on a study drawing upon data from over 12,000 small business owners. Idaho has a state gambling lottery which contributed $333.5 million in payments to all Idaho public schools and Idaho higher education from 1990 to 2006. Idaho's energy landscape is favorable to the development of renewable energy systems. The state is rich in renewable energy resources but has limited fossil fuel resources. The Snake River Plain and smaller river basins provide Idaho with some of the nation's best hydroelectric power resources and its geologically active mountain areas have significant geothermal power and wind power potential. These realities have shaped much of the state's energy landscape. Most of the energy consumed in Idaho is imported from other states. Imports account for more than 80% of total energy consumption, including all of Idaho's natural gas and petroleum supplies and more than half of its electricity. Of the electricity consumed in Idaho in 2005, 48% came from hydroelectricity, 42% was generated by burning coal and 9% was generated by burning natural gas. The remainder came from other renewable sources such as wind. The state's numerous river basins allow hydroelectric power plants to provide 556,000 MWh, which amounts to about three-fourths of Idaho's electricity generated in the state. Washington State provides most of the natural gas used in Idaho through one of the two major pipeline systems supplying the state. Although the state relies on out-of-state sources for its entire natural gas supply, it uses natural gas-fired plants to generate 127,000 MWh, or about ten percent of its output. Coal-fired generation and the state's small array of wind turbines supplies the remainder of the state's electricity output. The state produces 739,000 MWh but still needs to import half of its electricity from out-of-state to meet demand. While Idaho's 515 trillion BTU total energy consumption is low compared with other states and represents just 0.5% of United States consumption, the state also has the nation's 11th smallest population, 1.5 million, so its per capita energy consumption of 352 million Btu is just above the national average of 333 million Btu. As the 13th‑largest state in terms of land area (83,570 sq. mi=53,485,000ac), distance creates the additional problem of "line loss". When the length of an electrical transmission line is doubled, the resistance to an electric current passing through it is also doubled. In addition, Idaho also has the 6th fastest growing population in the United States with the population expected to increase by 31% from 2008 to 2030. This projected increase in population will contribute to a 42% increase in demand by 2030, further straining Idaho's finite hydroelectric resources. Idaho has an upper-boundary estimate of development potential to generate 44,320 GWh/year from 18,076 MW of wind power, and 7,467,000 GWh/year from solar power using 2,061,000 MW of photovoltaics (PV), including 3,224 MW of rooftop photovoltaics, and 1,267,000 MW of concentrated solar power. The Idaho Transportation Department is the government agency responsible for Idaho's transportation infrastructure, including operations and maintenance as well as planning for future needs. The agency is also responsible for overseeing the disbursement of federal, state, and grant funding for the transportation programs of the state. Major airports include the Boise Airport serving the southwest region of Idaho, and the Spokane International Airport (in Spokane, Washington), which serves northern Idaho. Other airports with scheduled service are the Pullman-Moscow Regional Airport serving the Palouse; the Lewiston-Nez Perce County Airport, serving the Lewis-Clark Valley and north central and west central Idaho; The Magic Valley Regional Airport in Twin Falls; the Idaho Falls Regional Airport; and the Pocatello Regional Airport. The Union Pacific Railroad also crosses southern Idaho traveling between Portland, Oregon, Green River, Wyoming, and Ogden, Utah and serves Boise, Nampa, Twin Falls, and Pocatello. The Port of Lewiston is the farthest inland Pacific port on the west coast. A series of dams and locks on the Snake River and Columbia River facilitate barge travel from Lewiston to Portland, where goods are loaded on ocean-going vessels. The constitution of Idaho is roughly modeled on the national constitution with several additions. The constitution defines the form and functions of the state government, and may be amended through plebiscite. Notably, the state constitution presently requires the state government to maintain a balanced budget. As result, Idaho has limited debt (construction bonds, etc.). All of Idaho's state laws are contained in the Idaho Code and Statutes. The code is amended through the legislature with the approval of the governor. Idaho still operates under its original (1889) state constitution. The constitution of Idaho provides for three branches of government: the executive, legislative and judicial branches. Idaho has a bicameral legislature, elected from 35 legislative districts, each represented by one senator and two representatives. Since 1946, statewide elected constitutional officers have been elected to four-year terms. They include: Governor, Lieutenant Governor, Secretary of State, Idaho state controller (Auditor before 1994), Treasurer, Attorney General, and Superintendent of Public Instruction. Last contested in 1966, Inspector of Mines was an original elected constitutional office. Afterward it was an appointed position and ultimately done away with entirely in 1974. Idaho's government has an alcohol monopoly. The governor of Idaho serves a four-year term, and is elected during what is nationally referred to as midterm elections. As such, the governor is not elected in the same election year as the president of the United States. The current governor is Republican CL "Butch" Otter, who was elected in 2006, and re-elected in 2010 and 2014. Idaho's legislature is part-time. However, the session may be extended if necessary, and often is. Because of this, Idaho's legislators are considered "citizen legislators", meaning their position as a legislator is not their main occupation. Terms for both the Senate and House of Representatives are two years. Legislative elections occur every even numbered year. The Idaho Legislature has been continuously controlled by the Republican Party since the late 1950s, although Democratic legislators are routinely elected from Boise, Pocatello, Blaine County and the northern Panhandle. The highest court in Idaho is the Idaho Supreme Court. There is also an intermediate appellate court, the Idaho Court of Appeals, which hears cases assigned to it from the Supreme Court. The state's District Courts serve seven judicial districts. Idaho is divided into political jurisdictions designated as counties. Since 1919 there are 44 counties in the state, ranging in size from 410 to 8,502 square miles (1,060 to 22,020 km2). Total Counties: 44. Total 2008 Population Est. : 1 523 816. Total Area: 87,530 square miles (226,700 km2). Three counties were first designated as such by the Washington Territorial Legislature in 1861; they were subsequently redesignated as Idaho counties in 1864. The 1861 Nez Percé county has since been broken up into Nez Percé, Lewis, Boundary, Benewah, Latah, Kootenai, and Clearwater counties. Idaho license plates begin with a county designation based on the first letter of the county's name. Where a letter is at the beginning of more than one name, a number accompanies precedingly in alphabetical order. This reflects an anomalous coincidental situation wherein 10 counties begin with B, seven with C and four with L, which is 21 of the 44 counties. After the Civil War, many Midwestern and Southern Democrats moved to the Idaho Territory. As a result, the early territorial legislatures were solidly Democrat-controlled. In contrast, most of the territorial governors were appointed by Republican presidents and were Republicans themselves. This led to sometimes-bitter clashes between the two parties, including a range war with the Democrats backing the sheepherders and the Republicans the cattlemen. That ended with the "Diamondfield" Jack Davis murder trial. In the 1880s, Republicans became more prominent in local politics. In 1864, Clinton DeWitt Smith removed the territorial seal and the state constitution from a locked safe, and took them to Boise. This effectively moved the capital from where they were stored (Lewiston, Idaho) to the current capital Boise, Idaho. Since statehood, the Republican Party has usually been the dominant party in Idaho. At one time, Idaho had two Democratic parties, one being the mainstream and the other called the Anti-Mormon Democrats, lasting into the early 20th century. In the 1890s and early 1900s, the Populist Party enjoyed prominence while the Democratic Party maintained a brief dominance in the 1930s during the Great Depression. Since World War II, most statewide elected officials have been Republicans. The last time the Democratic Party held a majority in either house of the state legislature was the House of Representatives in 1958 by one seat. However, Democrats did hold the governorship from 1971 to 1995, despite the state's Republican tilt. Idaho Congressional delegations have also been generally Republican since statehood. Several Idaho Democrats have had electoral success in the House over the years, but the Senate delegation has been a Republican stronghold for decades. Several Idaho Republicans, including current Senator Mike Crapo, have won reelection to the Senate, but only Frank Church has won reelection as a Democrat. Church was the last Idaho Democrat to win a U.S. Senate race, in 1974. Walt Minnick's 2008 win in the First Congressional District was the state's first Democratic Congressional victory in 16 years. In modern times, Idaho has been a reliably Republican state in presidential politics as well. It has not supported a Democrat for president since 1964. Even in that election, Lyndon Johnson defeated Barry Goldwater in the state by fewer than two percentage points, compared to a landslide nationally. In 2004, Republican George W. Bush carried Idaho by a margin of 38 percentage points and with 68.4% of the vote, winning in 43 of 44 counties. Only Blaine County, which contains the Sun Valley ski resort, supported John Kerry, who owns a home in the area. In 2008 Barack Obama's 36.1 percent showing was the best for a Democratic presidential candidate in Idaho since 1976. However, Republican margins were narrower in 1992 and 1976. In the 2006 elections, Republicans, led by gubernatorial candidate CL "Butch" Otter, won all the state's constitutional offices and retained both of the state's seats in the United States House of Representatives. However, Democrats picked up several seats in the Idaho Legislature, notably in the Boise area. Republicans lost one of the House seats in 2008 to Minnick, but Republican Jim Risch retained Larry Craig's Senate seat for the GOP by a comfortable margin. Minnick lost his seat in the 2010 election to Republican State Rep. Raul Labrador. The Idaho State Board of Education oversees three comprehensive universities. The University of Idaho in Moscow was the first university in the state (founded in 1889). It opened its doors in 1892 and is the land-grant institution and primary research university of the state. Idaho State University in Pocatello opened in 1901 as the Academy of Idaho, attained four-year status in 1947 and university status in 1963. Boise State University is the most recent school to attain university status in Idaho. The school opened in 1932 as Boise Junior College and became Boise State University in 1974. Lewis-Clark State College in Lewiston is the only public, non-university 4-year college in Idaho. It opened as a normal school in 1893. Idaho has four regional community colleges: North Idaho College in Coeur d'Alene; College of Southern Idaho in Twin Falls; College of Western Idaho in Nampa, which opened in 2009, College of Eastern Idaho in Idaho Falls, which transitioned from a technical college in 2017. Private institutions in Idaho are Boise Bible College, affiliated with congregations of the Christian churches and churches of Christ; Brigham Young University-Idaho in Rexburg, which is affiliated with The Church of Jesus Christ of Latter-day Saints and a sister college to Brigham Young University; The College of Idaho in Caldwell, which still maintains a loose affiliation with the Presbyterian Church; Northwest Nazarene University in Nampa; and New Saint Andrews College in Moscow, of reformed Christian theological background. McCall College is a non-affiliated 2-year private college in McCall, which was founded in 2011 and later opened in 2013. Central Idaho is home to one of North America's oldest ski resorts, Sun Valley, where the world's first chairlift was installed in 1936. Other noted outdoor sites include Hells Canyon, the Salmon River, and its embarkation point of Riggins. The Boise Open professional golf tournament is played at Hillcrest Country Club since 1990 as part of the Web.com Tour. High school sports are overseen by the Idaho High School Activities Association (IHSAA). In 2016, Meridian's Michael Slagowski ran 800 meters in 1:48.70. That is one of the 35 fastest 800 meter times ever run by a high school boy in the United States. Weeks later, he would become only the ninth high school boy to complete a mile in under 4 minutes, running 3:59.53. State song: "Here We Have Idaho"
River Phoenix and Keanu Reeves starred in the movie My Own Private Idaho, portions of which take place in Idaho. The 2004 cult film Napoleon Dynamite takes place in Preston, Idaho. The director and his wife, Jared and Jerusha Hess, attended Preston High School. Judy Garland performed the elaborate song-and-dance routine "Born in a Trunk in the Princess Theater in Pocatello, Idaho" in the 1954 version of the film A Star is Born.